Buying a vehicle is a big purchase decision, so it's very important to do your homework before you walk onto the dealer's lot. If your looking for a good deal, take advantage of these guidelines and do your research on the automobile you plan to buy online. I suggest purchasing a used auto instead of a new one. New cars drop in value the second you drive it off the dealer's lot. Try buying used and let others take the fall on depreciation. On the other hand, when you purchase used, you are buying that automobile "as is" despite what condition the vehicle is in. Yet, with these safety tips on purchasing used, your wallet will be happy you did. Since you never really know how the previous owner treated that vehicle, purchasing a used vehicle has some risks. Use Consumer Reports to gather information on used cars to see what models have been proven reliable. Check out the list on what cars to avoid and never buy a vehicle that is on those lists. Carfax is a great way to find out if there are title problems, odometer rollback, liens, salvage history, and more! AutoCheck will give you the vehicle's history and compare it with other vehicles. Make sure to grab the VIN number to see exactly what the automobile has been through in the past. It's smart idea to have a certified mechanic look at the used vehicle before you make the purchase. A lot of people buy from "private" sellers and the seller is not required by law to be truthful about the condition of the vehicle their selling. If you need a certified diagnostic mechanic, check out the National Institute for Automotive Service Excellence to find one near you. Try making that a condition of the purchase. If the seller ask for a deposit, clearly put it in writing that the money will be returned if the vehicle fails the inspection. Typically, dealers have mechanics that check out the vehicles they sell on the lot, but you should consider hiring your own mechanic if you are second guessing the condition of the vehicle. Keep in mind the total operating cost once you have chosen a few different vehicles you want to purchase. You'll need to know how expensive the car insurance will be before you purchase that automobile. There are tons of insurance companies to choose from all competing for your business, so compare rates. Find the best rate that fits your needs and share it with each competitor to see if they can beat it. Typically, rates vary from state to state. Get a free quote and call a few insurance companies like Geico, Allstate, Travelers, and American Family among many others. To get an idea on gas cost, get the MPG on that particular vehicle. Consider how expensive the maintenance cost would be if something goes wrong. Foreign cars typically have higher maintenance costs and run on premium fuel. Prearrange your auto loan financing before you step foot into a dealership. Dealers can make money on a loan, so make sure to get pre-qualified elsewhere. More often that not, credit unions can offer low rates on auto loans, but compare those rates with your local bank and online lenders. Your looking for the lowest interest rate you can possibly get. If you are pre-qualifided for an auto loan, it changes the game at the dealership and puts you in the driver's seat. Tell the dealer the interest rate you have been quoted to see if they can beat it. Now the dealer cannot mark up the loan because you have already done your research. Lenders will be able to get monthly payments lower by extending the length of the loan, but in the end, your still paying interest on the full amount of that loan. I recommend to never get a loan for longer than 42 months, if you cannot afford the monthly payment, try buying a less expensive automobile. Make sure to do your homework online before you begin negotiating the price of your vehicle. Visit Kelly Blue Book and Edmunds to find out what a competitive price would be for the automobile you are looking to buy. The website will give you an idea on both "private" and "dealership" prices. Use them to compare the value of a particular automobile and help you figure out what type of condition that automobile is in. Check out the prices of other local dealerships and private sellers. There are many used vehicles on websites like Auto Trader and CarMax. Now you have found the best deal near you and can use the dealership's competitors as leverage to get them to drop to the price you are willing pay. If they really want your business, the dealer must offer a competitive price to those you have found somewhere else. Many car salesmen have been characterized as sleazy individuals who will do whatever they can to close a sale. The fact remains, they are working to make a commission off the sale of your vehicle. Once you are ready to talk financing, the salesperson will tell you they have to talk with their manager to see if they can get you a better deal on your vehicle. Then they come back looking defeated saying they tried, but their manager would not help out with a better price. 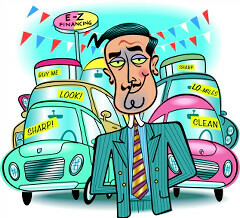 Car salesmen have the upper hand because they sell cars everyday and hope that you will agree to a higher price. Yet, if you have done your homework, you can come in with a direct no-hassle price. There is no need to agree on paying the higher price because you already know the value of the automobile you are buying. You should never buy an automobile alone. Never rush into a decision and bring a relative or friend with you to help make a decision. They will help you decide if the salesperson is being honest and help point out defects on the automobile that may entice the salesperson to lower the price. When your negotiating, be nice and spend as much time as you can in gathering all of the necessary information about the automobile. Tell them to provide the Carfax or AutoCheck score. Try not to get overly excited, even if this is the automobile you have been looking for. The car salesperson is hoping you'll make a quick decision and it's imperative that you have done all your research before drive away.